If you’re looking for a creative way to enhance your photo shoots or amateur photography sessions, we have just the gadget for you – meet Exilim EX-FR10 by renowned electronics manufacturer Casio, the first action camera that sports a split design for simplified use and wider perspective variety. Boasting an innovative two-part design, Exilim EX-FR10 has a wireless camera that can be detached from or docked with the main body by a simple press of a button. 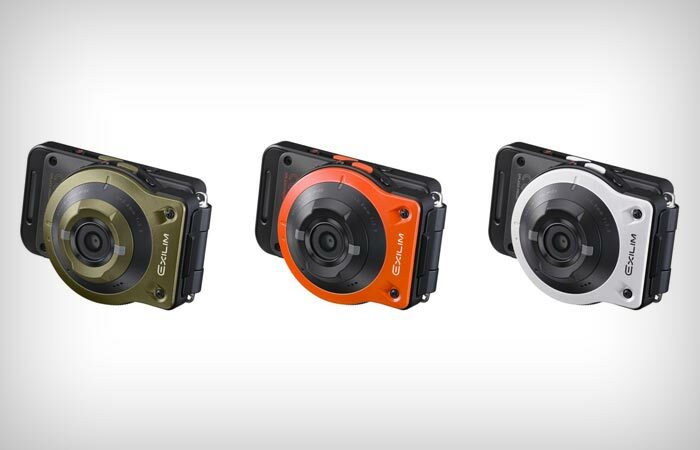 Whether used in the fully assembled or detached configuration, Casio’s latest action camera promises outstanding footage sync thanks to the integrated Bluetooth connection within some ten meters of wireless range. This means that you can take pictures in the remote shooting configuration and check the images out on the 2-inch 230k-dot touch screen, which translates as easier and user-friendlier approach to photography. On top of that, Exilim also comes with an interval shooting function for simple hands-free photo and video recording in the split mode via shutter button. In addition to the split configuration, Exilim also offers two more shooting options: the self-portrait mode for ultimate selfies and self-depicting videos, and the conventional style where you dock the cam to the main unit body for a taste of the traditional image and footage recording. Packing a 21 millimeter lens topped with an aperture of f/2.8 and contrast detection AF, Exilim EX-FR10 offers +/-2EV exposure compensation and has a backlit 1/2.3-inch CMOS sensor that can capture 14MP stills and 1920×1080 HD videos to the maximum length of 29 minutes. All recorded files are safely stored on the MicroSD card so you need not worry about losing them by accidental press of a button. 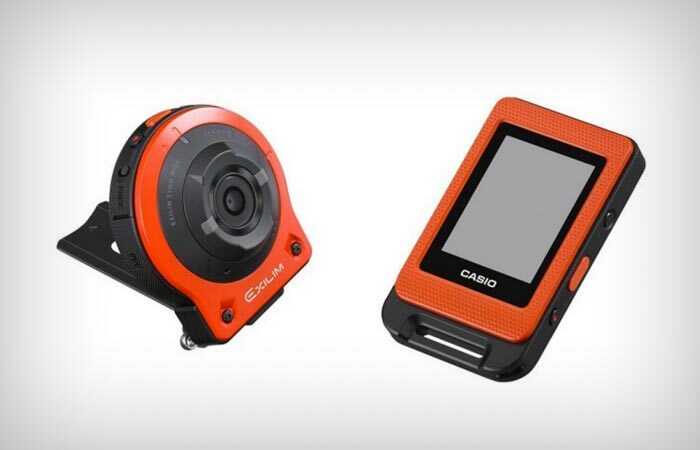 Casio’s latest camera also sports a mono-microphone and speaker, as well as built-in Wi-Fi for immediate image and video sharing via tablet or phone. Exilim is also said to be dustproof, water-proof (to the depth of 1 meter for 30 minutes of immersion) and shock-proof (for drops up to 2 meters of height). Casio also threw in some smart image and footage editing functions like Highlight Photo and Highlight Movie to additionally facilitate your photography and movie-making ventures. Sizing 60.9 x 28.8 millimeters and weighing as few as 63 grams, the camera unit easily docks onto the main body to produce a sturdy 61 x 153 x 34 millimeter unit (175 grams). On top of all that, Exilim also comes with a snug Neck Strap and Carabiner Strap, and the Tripod Nut compatible with most camera tripod mounts is also available from Casio. 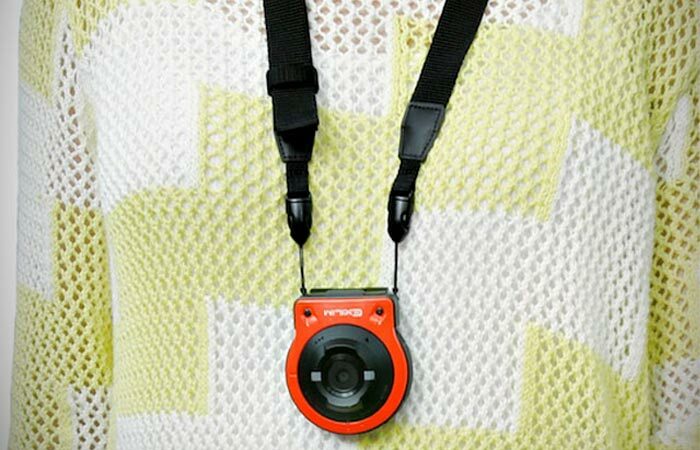 There are also a few 360-degree turning optional accessories for your new camera that you may fancy in case you’re a keen photographer who likes to have his gear close at hand at all times, such as the Multi-angle Clip for securing your camera to a backpack, or the Multi-angle Belt Set for strapping your gear to the wrist or head and the Tripod Mounter which you can use to attach your camera unit or controller to a regular adaptor compatible with tripod screws. With the EX-FR10, the new age of photography is just around the corner so make sure you grab your next Casio Exilim camera as soon as it makes its big appearance on the global market.